UNITE HERE Local 8 represents 5,000 workers in the hospitality industries of Oregon and Washington State. 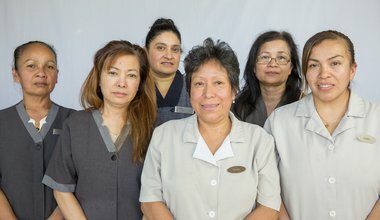 Local 8 members work in hotels, restaurants, food service, and airport concessions and include housekeepers, cooks, bartenders, bellmen, food and beverage servers, bussers, and dishwashers. Through organising, UNITE HERE members are aiming to transform thousands of traditionally low-wage jobs into good, family-sustaining, middle-class jobs.